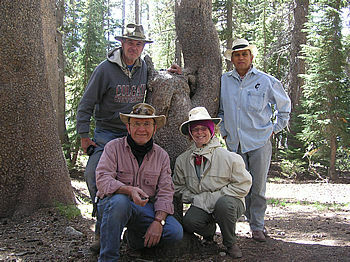 The annual Mike Pinelli led, post Labor Day, horseback trip to the high Sierras was held again this year. The "hearty band" this year was smaller than usual, numbering four: the participants, in addition to Mike, were Debbie Lamica, Oscar Guzman and Homer Eaton. 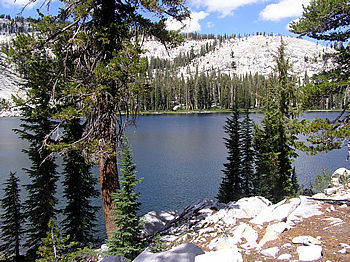 Once again the destination was Lillian Lake, which is in the Ansel Adams Wilderness just south of Yosemite National Park, at an elevation of about 8,800 feet. This year the trip was a total of seven days and six nights, with five of those nights spent camping. We left home on Labor Day, September 5, and spent that night in the Oakhurst Lodge in Oakhurst, near Bass Lake. From there, early Tuesday morning, we made the hour and a half drive to the Minarets Pack Station, where our gear was loaded on mules, our horses assigned, and the 12 mile ride to Lillian Lake started. It's about a 3 � hour ride, and we arrived mid afternoon with just enough time to get camp set up, a bottle of wine opened, and dinner prepared. Our camp site, as in past years, was the largest of the half a dozen camp sites on the lake. We only had company at an adjoining site one night, however, and other than a couple of hikers, those were the only people we saw during our entire stay. The setting is absolutely gorgeous and quite photogenic. Lillian Lake is rectangular, about forty acres in size. While the shoreline is walkable, float tubes are the way to fish. Last year, we caught mostly rainbows in the 6 to 9 inch range, with the occasional 12 inch fish. It was different this year in that the "brookies" have moved in! Probably 80 percent of our catch was brook trout with a goodly number in the 12 inch range. The only rainbows we caught were smaller fish. Mike hypothesizes that the rainbows have been driven out of the prime feeding areas and were probably in the deeper water. Wherever they were, Lillian Lake, last year to this, is a good example of how aggressive and dominant brook trout can be. The weather was a wee bit on the cold and windy side, with hail appearing one evening and temperatures down to the mid twenties a couple of nights. 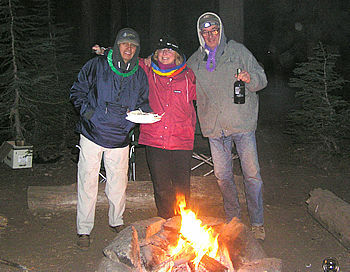 (Note the clothing on the folks hanging out at the camp fire in the accompanying photograph!) Except for the first day, the wind tended to discourage dry fly fishing, although everyone still managed to catch a respectable amount of fish on both dries and nymphs. Since there were four of us, each of us had a night to provide and to prepare a dinner. (All the dinners were excellent.) What to do the fifth night? Well, we did our best to deplete the brookie population, and kept a half dozen of the larger fish for dinner on the last night. Some of us had in mind that, like Mongo, we'd just wrap the fish in foil, add some wine and spices, and throw them on the coals. Oh no, not with Pinelli in camp! Mike filleted them, breaded and saut�ed them, and then prepared a reduction sauce with wine, capers and butter. Obviously we still had a bottle or two of good wine to work on, which completed a meal as good as any served in a high quality restaurant! Sunday morning came way too quickly. We broke camp right after breakfast, the packers arrived and had us packed up by noon, we were back at the pack station by 4:00 pm, had a quick fast food dinner in Oakhurst, and arrived home (very tired!) by about midnight. In spite of the weather this year being a little colder than one would hope for, Lillian Lake is a wonderful destination. The location is gorgeous, Mike's planning is great, the ride in and out is not difficult, the fishing is wonderful, and the company and comradeship are even better than that. Since this tends to be an annual affair, we urge folks to consider joining us next year.